POMEROY — A fighter to the end, a staunch advocate for his county and clients, a friend to all who knew him, Steve Story was remembered fondly on Monday by those who knew him best. Story, a former Middleport Solicitor, Meigs County Prosecutor and current County Court Judge, passed away on Saturday after a battle with cancer. Not one to sit back, Story worked up until Wednesday of last week, spending hours each week in his law office on Main Street and in County Court, where he had served as judge for nearly two decades. Those sentiments were echoed by Michelle Shupe and Pam Reeves, who work in Story’s Law Office. Reeves and Shupe noted that Story was devoted to his work, his business and his clients, spending nearly 40 years practicing law in Meigs County. Despite his battle with cancer, Story could often be found hearing cases in the courtroom and was preparing to run for re-election in November at the time of his passing. Local Attorney Mick Barr had stepped in as acting judge at the request of Story at times during the past year-and-a-half as he sought treatment. “Steve asked and I was honored to do what I could to help him and the court,” said Barr. Story was always one to help out a friend, a new attorney or anyone he met along the way. “Steve was a good friend and mentor. I was fortunate enough to work at his office when I finished law school, and I quickly learned that he genuinely cared about people. He was always willing to help someone, whether it be a stranger, friend or a family member. In fact, I don’t think he ever met a ‘stranger’ in the sense that he could befriend anyone and carry on a conversation as if they had known each other for years,” said Gallia County Assistant Prosecutor Jeremy Fisher. Likewise, Warner got her start working for Story, as did many others over the years. “He offered me my first public job in 1989 as an assistant prosecutor,” said Warner, calling Story a dear personal and family friend. Attorney Robert Bright also got his start with Story, who became much more to him over the years. Bright and Story maintained that connection even after the young attorney went out on his own. “We’ve been having lunch every week or two over the last year or more and he continued to ask me for assistance on some of his cases, just as I asked him for assistance on my cases. Even though his body was failing, his mind was sharp to the end and we often discussed politics and religion. I will miss his friendship and advice as long as I live,” said Bright. In a Facebook post over the weekend, Athens County Common Pleas Judge George McCarthy remembered Story as a friend and mentor. “Steve was my friend and mentor for many years. He was my first boss coming out of law school when he hired me as an assistant county prosecutor. I learned a lot with him during that time which I will always appreciate. Anyone who knew Steve knows he is one of the most genuine of people and one of the nicest guys you’ll ever meet. In all the years I’ve known him, I never ever heard him have bad words for anyone. He just didn’t have it in him. He battled with health issues which took its toll on him. But right up to the end, Steve was his jovial and fun loving self,” wrote McCarthy. While many knew Story as an attorney or judge, he was also an advocate for Meigs County, playing a big role in several projects. “Steve was an energetic and passionate advocate for economic development in the county over the past 30 years,” said Economic Development Director Perry Varnadoe. U.S. Route 33 between Darwin and Athens was one such project. “While many people were involved, it’s fair to say that the new US 33 in Meigs County would not be here without Steve’s relentless work in Columbus to push the project, as well as his ability to build county coalitions along the 33 corridor that spoke with one voice for the new highway. 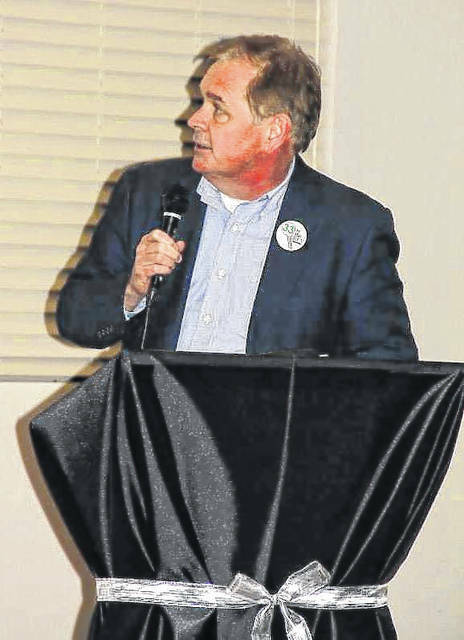 He was both respected and dreaded when he called upon government officials in Columbus because they knew he was there to advocate for Meigs County and came with facts, figures, and sincerity, and often wouldn’t leave without what he came for,” stated Varnadoe. It was Story’s advocacy for the county which Barr also remembered of his friend and fellow attorney. “We lost one of the proudest and strongest advocates for Meigs County,” noted Warner. State Rep. Jay Edwards also took to Facebook to remember Story. “One of the nicest guys I knew, Steve Story, passed away yesterday. Steve was Meigs County born and raised. He took me under his wing when I decided to run for office and introduced me to a lot of people around the county. He also would have me as his guest at the Pomeroy Gun Club. Everyone thought highly of him. He’s a great man,” wrote Edwards. While County Court Judge is a non-partisan position in Meigs County, Story was remembered as a strong supporter of the Meigs County Republican Party. “The Meigs County Republican Party lost a great friend yesterday with the loss of Judge Steve Story. Steve wasn’t just a great Republican. He was a great friend, a mentor to young candidates, and a son of Meigs County. Join us in prayer for the family, friends, and staff of Judge Story,” read a post on the party’s Facebook page. It was Story’s passion for Meigs County which was most noted by many. “He was conscientious of what he was doing and the impact it would have on the county,” said Commissioner Randy Smith. “Steve would often say that it’s amazing how much can be accomplished when no one cares about who gets the credit. That was what Steve was all about,” concluded Varnadoe. A complete obituary for Story appears on page A2 of today’s edition of The Daily Sentinel.